You are here: Home / General Information / Animals Today October 6, 2018. Helping animals affected by hurricane Florence. Dogs and cats living together. Another big step toward ending animal testing. The book, Engineering for Cats. We begin with Robert Misseri, President of Guardians of Rescue, a New York based organization that is providing relief and support to animals and people affected by hurricane Florence.Robert reminds us to be prepared for disasters and to evacuate with your pets when advised! Then, can cats and dogs happily coexist in the same household? Usually, yes, but there are certain things you can do to assure harmony. Lori explains. And, Halloween is coming up soon, so Lori offers pet safety tips for this season. Peter continues with Professor Thomas Hartung, from Johns Hopkins Bloomberg School of Public Health where he is Director of the Center for Alternatives to Animal Testing. Hartung is a toxicologist who is involved in many aspects discovering and implementing alternatives to testing chemicals and drugs on animals. His group recently developed a huge map of chemicals with known characteristics that permits the prediction of the properties of new substances. It is a big step toward eliminating animal testing. 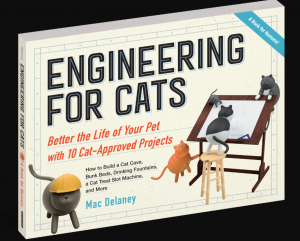 We conclude with author Mac Delaney, who tells us about his new book, Engineering for Cats. Delaney’s fun and practical offering provides ten cat-approved projects you can make at home to enhance your kitties’ lives. And, we review Planet Dog’s ball, Sol.